Editor’s note: This article originally ran in 2012. We updated it on September 4, 2014 to reflect the latest information for the 2014 season. You'll find an all-new version for the 2015 season here. 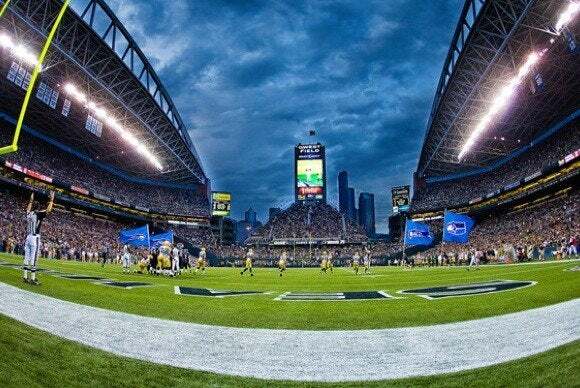 Another NFL season kicks off Thursday night when the Seattle Seahawks begin the defense of their Super Bowl crown by hosting the Green Bay Packers. And as 30 other football teams start a season they’re hoping ends at next year’s Super Bowl in Arizona, the National Football League is taking another step in a journey of its own, toward a world of digital and online streaming that other major sports leagues in the U.S. have already embraced. Football may be the most popular spectator sport in this country—it certainly has the TV ratings to back up that claim—but its approach to broadcasting its games remains firmly rooted in the 20th century. Baseball, basketball, hockey, and even soccer have all expanded their reach beyond traditional over-the-air and cable broadcasts to include mobile and online streaming of nearly every game. The NFL’s moves in that direction have been more tentative, with enough restrictions and limitations still in place to keep your eyes glued to a TV screen on autumn Sundays. Over the last few seasons, though, the NFL has slowly but surely moved toward more online streaming. The 2014 season will continue that trend, as the NFL rolls out a new app to mobile devices and set-top boxes that at least offers in-game highlights in lieu of the live streaming that other sports leagues provide as a matter of course. As another NFL season gets underway, here’s a guide to all your options—from TV to tablets and everything in between. With the NFL, TV remains the king—and for good reason. The NFL has only 16 regular-season games per team (compared to baseball’s 162), so each match-up is treated as a premium product. Plus, the relatively dependable schedule—Sunday afternoons from September through December—translates to easy appointment viewing for many people. Because each NFL team belongs to either the National Football Conference or American Football Conference, it’s easy for the league to divvy up the slate. Fox gets the NFC games, while CBS airs the AFC, with most contests starting on Sundays at either 1 p.m. or 4:25 p.m. ET. NBC gets the coveted Sunday Night Football telecast, which starts at 8:20 p.m. ET. Monday Night Football, which originated in 1970 on ABC, now lives on ESPN and kicks off at 8:30 p.m. ET. Starting this season, Thursday night games move to CBS—at least until late October. Football arrives on a broadcast network on Thursday night this year. In previous seasons, Thursday night games aired on the upstart NFL Network. Starting September 11 at 8:25 p.m. ET, CBS will show seven Thursday night games (with those broadcasts simulcast on the NFL Network.) The NFL Network resumes sole Thursday night coverage on October 30. Both CBS and the NFL Network will air games on Saturday, December 20 as well. That’s a lot of football available on a lot of channels. Unfortunately, to maximize its viewing audience and help fill stadium seats with the maximum number of butts, the NFL also enforces a complicated and arcane set of “blackout” rules and regional viewing restrictions. That means a) unless your team sells a certain percentage of seats for a game, that game will not air in your market, and b) your TV provider may at times broadcast seemingly random games in your area. Relief may be on the way, as the Federal Communications Commission is slated to vote on eliminating its sport blackout rule this fall, but that’s unlikely to bring football fans any relief during the 2014 season. To stay up on the broadcast TV offerings in your area, The506.com is an invaluable resource and it’s one you should bookmark for quick access in the fall. In addition to a complete weekly rundown of games, the site offers color-coded maps that show exactly which game will air where and on what network. Watch up to eight games at once on Sunday Ticket’s Mix channel, offered via DirecTV. A growing number of cable providers let their customers access the NFL’s RedZone Channel, which spends about seven hours each Sunday showing nothing but continuous highlights (mainly touchdown plays, hence the name) from every game, even cutting in to show live coverage when warranted. Hosted by Scott Hanson and aired at a frenetic pace that includes no commercial breaks, this entire channel exists solely for this seven-hour window on Sundays. Not since 24 went off the air has a TV program so emulated the rush of pure, nonstop adrenaline. It’s not for everyone, but it’s strangely addictive for some of us. The RedZone Channel along with NFL Network are available online, too, though you’ll only be able to access the online version if you’re a cable subscriber and if your cable company is among the listed providers. AT&T U-Verse, Cox, and Dish are among the supported providers for RedZone and NFL Network access (along with a host of regional cable operators); Comcast is not, a curious omission given that both the RedZone and NFL channels are available in Comcast’s cable packages. Still, the ultimate TV package—NFL Sunday Ticket—remains the exclusive property of satellite TV provider, DirecTV—and it’s probably going to stay that way for some time. DirecTV is reportedly close to extending its Sunday Ticket deal with the NFL into the next decade. With Sunday Ticket, DirecTV subscribers who are willing to pay up—an extra $240 on top of their regular subscription cost—can access every single Sunday afternoon out-of-market game, broadcast simultaneously along a gauntlet of channels. You can also watch up to eight games at once on what DirecTV calls the Mix Channel, and its Player Tracker lets you keep tabs on up to 20 players (a big perk for any fantasy football junkie). For an extra $90, you can sign up for the $330 NFL Sunday Ticket Max, which throws in NFL RedZone Channel and Short Cuts, which condenses games into 30-minute chunks for easier viewing after they air. For the first time this season, you’ll be able to access NFL Sunday Ticket without a satellite TV subscription, but there are restrictions. You have to live in a place where DirecTV isn’t available—an apartment, a college dorm, or in metropolitan New York, San Francisco, or Philadelphia. In other words, this isn’t a package for cord cutters but for people who can’t otherwise subscribe to DirecTV. If you do qualify, you can pay $200 for a regular season of out-of-market live NFL games on your laptop, desktop PC, and Android or iOS device. You can also pay $240 to watch on a compatible gaming console or $330 for access any device plus the RedZone channel. Pay up for the NFL Sunday Ticket Max package, and you can watch games on your mobile device. For most NFL Sunday Ticket subscribers, though, the way to watch games on the go will be to sign up for the Max package. You can stream games on iOS or Android devices, in addition to streaming live games on your computer. The app is free (well, after you’ve paid that $330 subscription to NFL Sunday Ticket Max, of course), and it’s an incredible value-add for customers who can’t get in front of a TV when their favorite team is playing. You’re not going to find any official live streaming outside of DirecTV’s Max package. NFL.com does offer something called GameRewind, which provides archived broadcasts of 256 regular season games after they air. (You also get 10 playoff games plus access to the NFL’s Super Bowl archives as well as games played between 2009 and 2013 if you really want to relive all those Jaguar-Texan tilts.) The service is available on computers and iOS and Android mobile devices. GameRewind also includes All-22 film, which had previously been only available to teams; it gives viewers wide-angled video that shows all 22 players on the field at once. That costs $70, while a scaled-down version (which opts for the regular game film as well as other viewing restrictions) costs only $40. You can also buy access to all of a specific team’s regular season games for $30. The official NFL Mobile app—free for iOS, Android, Windows Phone, and BlackBerry—doesn’t quite rise to the level of quality and content of MLB’s At Bat app, but it’s more than a glorified scoreboard. The NFL’s mobile offering provides video highlights, customizable team alerts that are easily set up, audio broadcasts, and built-in fantasy football updates (provided that you play through NFL.com). If you’ve got a More Everything plan with Verizon, you can watch live games on your mobile device at no additional cost. You can stream games—but only if you’re a Verizon customer. The Verizon version of the NFL Mobile app provides live access to any night game on Thursday, Sunday, and Monday, along with access to local home-market games on smartphones. Live games are available to Verizon customers with a More Everything plan at no cost, though all that video streaming will surely devour your allotted monthly data faster than a hurry-up offense. More Everything customers who’d also like access to a streaming version of the RedZone Channel will have to pay another $2 each month. If you’re a Verizon customer without a More Everything plan, you can still pay $5 a month for the premium live streaming features. Fox Sports is dipping a toe into live-game streaming this season, though with plenty of caveats. It’s going to stream 97 regular streaming games and four playoff games via Fox Sports Go, its website and app for iOS, Android, Kindle Fire, and Windows. The catches? Streaming will only be able to select cable subscribers, the featured games will only be the local ones available to your market, and streaming is only available on tablets or Fox Sports Go site. Verizon paid a pretty penny for the rights to stream games to smartphones, after all. A new app from the NFL doesn’t provide live streams of games, but it does promise a great deal of video content, including in-game highlights if you’re willing to part with a couple of bucks. NFL Now—available for Android, iOS, Windows, and Kindle Fire as well as set-top boxes including Apple TV, Roku, Fire TV, and the Xbox One—promises a personalized video stream of news, features, and highlights. You’ll have to create an NFL.com account, but you’ll be able to customize the flow of news to highlight your favorite team. Pay $2 a month for a premium NFL Plus subscription, and you can make the ubiquitous ads disappear, have greater access to the NFL Films archive, and—most significantly—enjoy in-game highlights. It’s not the kind of live streaming Sunday Ticket subscribers will experience, but it’s more than the NFL has provided in the past. 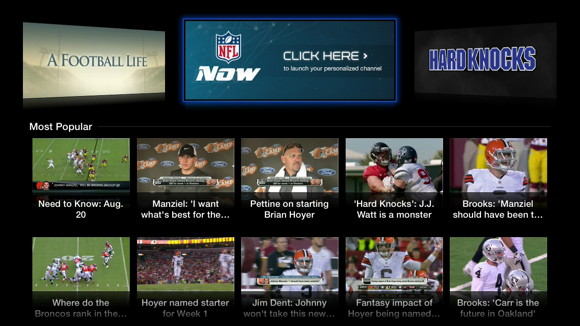 NFL Now, seen here on an Apple TV, promises a personalized video stream of news and features. Pay $2 a month for a premium subscription, and you can get in-game highlights, too. Outside of that, your (legal) streaming and mobile options are limited. The audience exists: Fox said it set a record for streaming a sporting event when it made last February’s Super Bowl XLVIII available for online streaming, boosting the streaming audience by 4 percent over 2013’s Big Game. If nothing else, it show’s there’s broad support for mobile and online options. And while the NFL appears to be listening, if only a little bit, for now the league seems perfectly content with the TV crown. Ian Paul contributed to this updated report. Updated at 9:25 a.m. PT on September 4, 2014 to include information on Fox Sports Go streaming.